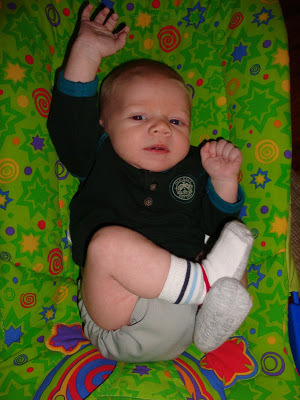 Home ParentingRaising BoysOscar	Cloth Diapering Update and a question! We are loving using cloth diapers but I have hit a wall with napping and I am not sure how to tackle it. Oscar sleeps in a disposable overnight and then I usually switch to cloth in the morning. However, the past few days have been a struggle sleep-wise and I have found that he will take longer naps in a disposable. The cloth diapers don’t leak but if I try to use cloth, he wakes up in that sensitive transition time (usually around 45 minutes) because he can feel the wetness. I have some BumGenius one size dipes that have worked pretty well at naptime, but they are so bulky that I think he is a little uncomfortable. They kinda spread his legs out like a frog. So, I have been using disposables for naps…which with a 2 month old pretty much means all day because he sleeps so much! What should we do? I don’t want to give up on cloth, but Oscar definitely needs his sleep. Right now we have a mixture of prefolds/covers, AIOS and the BGs. We like all of them for different reasons and Oscar doesn’t have a problem with them unless he is trying to sleep. Cloth mommies, got any ideas?? in my world, sleep always trumps everything, so i say do whatever you have to to get him to sleep. we use bumgenius at night. i know micah is bigger, though, so that doesn’t solve your uncomfortableness problem. i think we were using them all night by 2 months though and he did ok? might be worth a shot. hmmm, yes i too would say that whatever gets him the most sleep would be what i would do! i was too overwhelmed to even start cloth diapers until g was 3 months old. we still use a disposable at night because she is a very heavy wetter. she has been sleeping 12 hours at night since 6 months and i don’t want to mess with that! during the day we use prefolds with covers and then for naps we use fuzzi bunz or bumgenius. they seem to hold more and do better with keeping the wetness away from the skin i think. oh yeah, you could also try just using the tiny insert of the bumgenius for naps. smaller, but still the same softness. IT worked! Great nap and no leaks. Hooray!